ALL GROUP BOOKINGS MUST BE PAID IN FULL 14 DAYS BEFORE ARRIVAL. CANCELLATIONS WITHIN 14 DAYS OF ARRIVAL DATE ARE NON-REFUNDABLE. 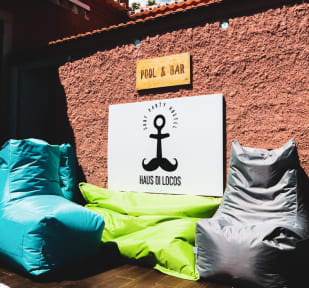 Our Adults Only, Premium Boutique Hostel with outdoor pool, sundeck and bar is designed for those seeking a luxury stay In Lisbon. Located a stones throw from the beach of São Pedro do Estoril, and minutes walking from the train station connecting you to Downtown Lisbon or Cascais, our location is ideal for those seeking a luxury beach stay. 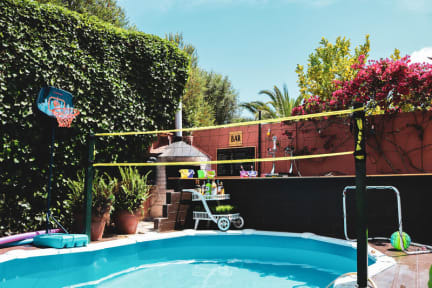 Lay back by the pool with a cocktail and meet new friends at our cosy boutique hostel. Our Hostel consists of six private rooms and one well-equipped dorm room sleeping six persons. Our dorm room offers our guests complete privacy with all beds boasting personal reading light, electrical socket to charge your devices and privacy curtain. Plus individual lockers to secure your personal items. All our rooms have free WIFI, and our rooms and facilities are kept super clean by our friendly and hospitable staff. Enjoy a stay at Haus di Locos now. Taxes not included - tourist tax 1.00 EUR per person per night (Max. 7 EUR). Taxes not included - 10.00 EUR per person for late check-in (after 00:00 untill 02:00).